A handful of kiddie movies hasn’t softened Dwayne Johnson. 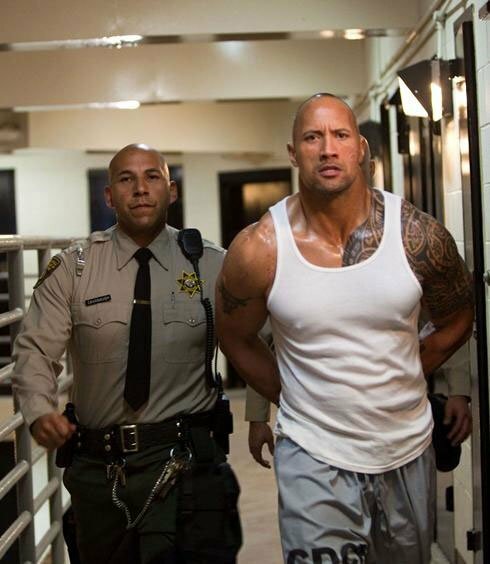 Check out this image of The Rock in his upcoming film Faster from USA Today. Clearly his Tooth Fairy costume is slimming because here he looks enormous, WWE enormous. The officer in this photo must not have a handle on him for long, because Johnson plays an ex-con determined to avenge his brother’s killing. Carla Gugino and Billy Bob Thornton join him as detectives who follow close behind while connecting the dots between the ongoing chase and the brother’s murder. Those lucky enough to be at ShoWest can check out the film tomorrow, but for the rest of us, we’ll have to wait to see Johnson back in fighting form until November 19th.